After being cut in her first USA Basketball camp, Boston is an emerging talent on U.S. junior nationla team rosters. 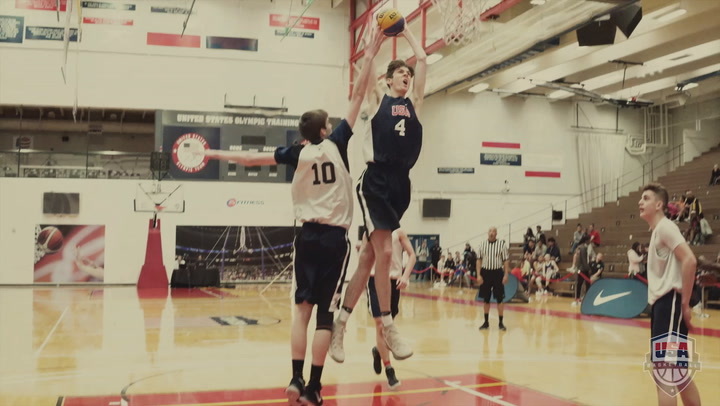 Every player who earns an invitation to a USA Basketball training camp prior to the selection of national teams has made sacrifices in their personal lives to get there. Aliyah Boston has sacrificed and then some. Boston, a 6-foot-4 forward from Worcester Academy in Massachusetts, grew up in St. Thomas in the U.S. Virgin Islands. She began to fall in love with basketball when she was 9, watching her older sister Alexis play the game. Just a few years later, the Boston sisters decided to move from a place many see as paradise to New England, all to give themselves a better chance at a brighter future. They left their parents behind in St. Thomas and moved in with an aunt, Jenaire Hodge, hoping to develop both academically and in their basketball careers, and see how far their talents could take them. Over the past four years, Aliyah Boston has seen her parents only a few times each school year, and then again in July for a longer stretch when they come to watch her play AAU basketball. Boston was invited to compete for a spot on a USA Basketball roster for the third-straight year this spring, participating in the 2018 USA Women’s U17 World Cup Team Trials. She was named a finalist for the 2016 USA U17 World Cup Team, but just missed making the final roster. Last year she not only made the cut, she led the 2017 USA U16 National Team in scoring and rebounding (11.8 ppg. and 8.6 rpg.) as it won the gold medal at the FIBA Americas U16 Championship in Buenos Aires, Argentina. And, after helping lead the USA to its spotless 5-0 record, Boston was named MVP of the U16 championship. She said she learned lessons from both of her previous USA Basketball experiences. Last summer, she noticed some of the other post players she competed against in training camp and then in international play had more to their games than she did. She was more of true post player at that point while others could handle the ball and shoot from distance. Boston has dedicated herself over the past year to working on her ballhandling and perimeter shooting. She said her high school coach, Sherry Levin, and her AAU coach, Walter Welsh, have been instrumental in her becoming a more well-rounded player. She said prior to this summer's U17 World Cup Team Trials that she was feeling confident with how she has progressed in those areas. While she doesn’t get to see her parents as much as most of the players with whom she competes, she said they instilled in her the work ethic that has brought her this far. Her parents work on the island as a bartender and a manager. She also credits her aunt, who is a catering director. “I started playing basketball because of my older sister,” Boston said. “When I was younger I kind of wanted to do whatever she did. She started playing basketball. So I did, too. My parents have been helpful since I started. Boston has developed into one of the most sought-after recruits in the country in the 2019 class. As of May, she had trimmed her list of schools to six, but she wasn’t ready to identify any specifically. It won’t be long before she chooses where she will spend the next four years, fulfilling a dream she began working towards years ago in the Caribbean sunshine. But for now, she is hoping for another chance to represent her country in international play this summer. Selected for the 2018 USA Basketball Women's U17 World Cup Team, Boston helped lead the USA to a 7-0 record and the gold medal in Belarus. In the USA's 92-40 win over France in the gold medal game, she led the USA offense with 16 points and added eight rebounds. Starting for the Americans in all seven games, Boston averaged team-highs of 11.3 points and 7.1 rebounds a game, and added a team-best nine blocked shots. For her outstanding showing, she was named to the FIBA U17 World Cup All-Star Five Team. Boston has another opportunity to win gold. She is currently competing at the 2018 Youth Olympic Games in Buenos Aires, Argentina. She is on a 3x3 USA Team with Paige Bueckers, Samantha Brunelle and Hailey Van Lith, a squad that won the 2018 USA Basketball 3x3 U18 National Championship in the spring, which qualified them to represent the USA at the Youth Olympic Games. Going 4-0 to finish first in in Group B preliminary play, the USA women defeated the Netherlands 18-14 in the quarterfinals Monday and have now advanced to the semifinals where they will continue to pursue their gold medal dream and play China at 10:25 a.m. EDT on Tuesday. The game will be available to watch live online at: YouTube.com/Olympics or OlympicChannel.com. The semifinal winners will compete in the gold medal game on Tuesday at 1 p.m. EDT on Oct. 17, and the semifinal losers will battle for the bronze medal at 12 p.m. EDT on Oct. 17. Follow along with the USA Basketball Men's and Women's Youth Olympic Games teams at USAB.com and on USA Basketball's social media channels.